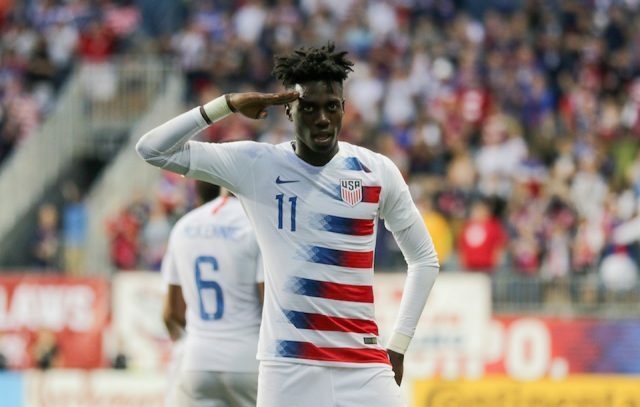 In the second installment of a weekly piece by writer Cullen McIntyre where he’ll be looking at up-and-coming stars in the U.S. Men’s National Soccer Team, we continue the series looking at forward Timothy Weah. Weah is a legendary name in the world of soccer, due to his father George Weah being a Ballon d’Or winner and one of the best players the world has seen. Though his father represented Liberia and is currently the President of the African country, Weah was born in New York City on February 22, 2000. His raising in the United States has influenced his decision to represent the stars and stripes on the international level. He began playing soccer at a young age in Florida, playing for West Pines United, and then moved back to Queens, New York to play for Rosedale Soccer Club, owned by his uncle. Weah would begin to show off his talent in the three years he spent at BW Gottschee, a soccer team based out of New York that competes in the U.S. Soccer Development Academy system. During this time, Weah appeared for the United States U-14 squad in 2012. In 2013, Weah joined the New York Red Bulls Academy, spending only a year there before relocating to France to join the Paris Saint-Germain Academy in 2014. In his first start for the academy team, the young forward scored a hat-trick in an 8-1 victory over Ludogrets Razgrad in the UEFA Youth League. During his time in the PSG Academy, he also appeared for the United States U-15 team at the Tournament Delle Nazioni in Italy. Weah scored a goal in the 3-2 victory over Austria to win the U-15 tournament for the United States. Following his spell with the U-15’s, he would get called up to the U-17 side in 2015, playing in the Montaigu Tournament in France. Weah’s goal in the final secured a victory over France to win the tournament. Like last week’s spotlighted player, Josh Sargent, Weah played in the 2017 CONCAF U-17 Championship, where the United States finished second. He would score twice in the tournament before also being named in 2017 FIFA U-17 World Cup in India. Weah’s hat-trick in the first knockout game against Paraguay was the first one recorded by a U.S. men’s national team player at any level during the knockout stages of a World Cup and the fifth overall for any American male player at a World Cup. It was also in 2017 that Weah would sign a three-year professional contract with Paris Saint-Germain, but would spend the season with the Paris Saint-Germain B team (U-19), scoring four times in 15 appearances. He would make his first team debut on March 3, 2018, coming on in the 79th minute of the match. In the same month, Weah made his senior debut for the United States Men’s National Team in 1-0 friendly over Paraguay. Coming on as a substitute in the 86th minute, Weah became the first player born in the 2000s to earn a senior cap for the United States. His first start for Paris would be in the last game of the 2017/18 season, in a 0-0 draw to Stade Malherbe Caen. Weah’s first goal for the United States would also occur in the same month, as the United States hosted Bolivia for a friendly on May 28, 2018. Weah’s goal in the 59th minute secured a 3-0 victory, and also made him the fourth-youngest player to score for the United States, ahead of Sargent, who scored his first earlier in the match. On Aug. 4, Weah would grab his first competitive goal for Paris in a 4-0 win over AS Monaco in the Trophee des Champions. His first league goal would come a weak later in the season opener against Caen, where Paris toppled them 3-0. Fitting into the Paris Saint-Germain side was a challenge for the young American, as the rich side is full of world-class talent. It was announced on January 7, 2019, that Weah would be sent to Scottish side Celtic on a six-month loan deal. He made his debut on January 19, subbing on in the 69th-minute against Airdrionians in the Scottish Cup fourth round, scoring a goal in the 3-0 win. The 19-year-old striker has made 11 appearances for Celtic, scoring three goals this season. His development will continue at the Scottish side that sits atop of the Scottish Premiership. He has also appeared eight times for the USMNT and spent the last international friendly alongside Sargent in the U-23’s. Weah has a chance to become a world-renowned star as he continues to play for the best team in France, Paris Saint-Germain. Should he break into the first team in the coming years he will be among some of the most talented players in the world, bringing quality not only to the Paris attack but to the United States as well.